CFC Head Start Fall River has a Read Across America Event on Dr. Seuss Day! More Exciting news from HCS Head Start: Educare Groundbreaking! September 17th ground breaking covered here! 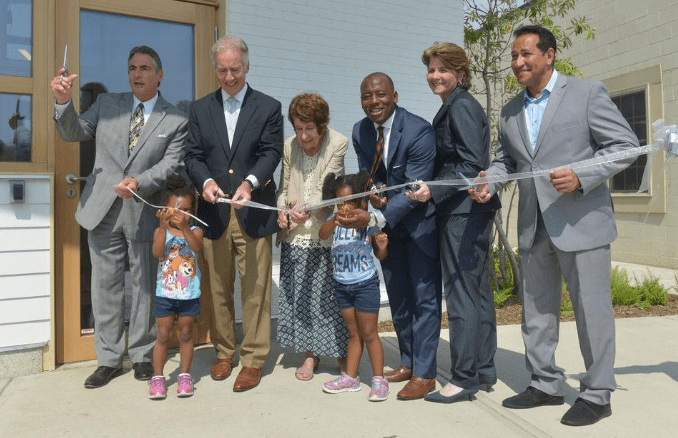 From the Educare Schools website: Educare Springfield, the first Educare school in Massachusetts, will serve young children and their families with a full-day, year-round program. The school will be a landmark lab school for best practices and an essential resource for Springfield College, Springfield Technical Community College, Springfield Public Schools, and the early education community across the state for training and providing professional development for future teachers, social workers, evaluation and research. Educare Springfield will also pursue opportunities for partnerships and collaborations in the local community. MGM Casino opens center for Holyoke Chicopee Springfield Head Start! Go to NHSA Happenings for the story here! Triumph, Inc.’s very own Audrey Reese and Anne Stamper—Grandparents raising their Grandchildren representing Triumph Head Start in Washington DC! Coordinating Efforts to Treat the Opioid Crisis—Earlier in the week, NHSA’s Cody Kornack and Sarah Neil joined early childhood development experts from around the country for a two-day meeting to chart a path forward for children and families impacted by the growing opioid and substance misuse crisis. Experts from the Office of Head Start, Substance Abuse and Mental Health Administration (SAMHSA), the medical community, and regional Head Start offices participated in the event. NHSA was invited to participate in this planning workshop because of its work advocating for more support for the critical role Head Start programs have taken in helping children and families harmed by substance abuse. Senator Elizabeth Warren visits ABCD Head Start! Families Unite for Head Start Rally! Congressman Joe Kennedy III and Mayor Thomas Hoye pay a visit to Triumph Inc. Head Start in Taunton! The children, staff, Policy Council and Board Members, grandparents, and families truly enjoyed meeting the politicians and their staff! Click here for more photos from the Taunton Daily Gazette. BOSTON – Boston Medical Center (BMC), in partnership with Action for Boston Community Development’s (ABCD) Head Start program, has helped mothers experience a 40 percent reduction in the emergence of clinically significant depressive symptom episodes. Among the study’s subpopulation whose initial depression screening indicated low depressive symptom levels, they experienced a 61 percent reduction. The five-year study screened more than 2,200 mothers for their depression risk within Head Start locations in the Boston area and was the first to use lay health workers to deliver a depression prevention intervention within a community based agency. The study, published in JAMA Psychiatry, could also help shape public health policy for improving mental health screening and preventing depression in mothers with young children. Maternal depression affects approximately 12 million women in the United States each year. It also disproportionately impacts low-income and minority women; work by the U.S. Department of Health and Human Services found that depression impacts almost half of all Head Start mothers. Depression not only impacts mothers, but their children and families as well. Children of depressed mothers are two to three times more likely to develop a mood disorder, and they are at increased risk for impaired cognitive, social and academic functioning, and poor physical health, according to the Encyclopedia of Early Childhood Development. Preventing depression in mothers therefore has implications for both generations. In 2009, the Institute of Medicine called for initiatives to take place in community-based venues capable of providing services for both adults and children. Head Start, a national, federally-funded early learning program that addresses the needs and provides services for approximately one million low-income families each year, is one such venue. A lay health worker, according to the World Health Organization, is someone who performs functions related to health care delivery and is trained in the context of an intervention, but has not received a formal professional or paraprofessional certificate. BMC trained and certified 15 lay health workers to deliver a brief intervention called Problem Solving Education (PSE) in the context of a family’s Head Start services. This randomized-control trial assessed the impact of six sessions of PSE as a brief intervention, which included problem solving, depressive symptom monitoring and referral to further treatment when necessary. These sessions were completed at home visits or in Head Start centers. Mothers who went through PSE sessions experienced a 40 percent reduction in the emergence of clinically significant depressive symptom episodes. Among the subpopulation whose initial screening indicated low depressive symptom levels, after they went through PSE sessions, they experienced a 61 percent reduction. “Our novel approach to depression as a preventable illness, and to harnessing the ability of Head Start to reach vulnerable families in a community setting, has allowed us to truly make an impact on preventing maternal depression or on stopping low-level symptoms from getting worse,” said Michael Silverstein, MD, BMC’s associate chief medical officer for research and population health and the study’s first author. Parents are typically deeply involved in the Head Start program, as it offers a high level of interpersonal attention; its typical services are regular family needs assessments, home visits, parenting groups, referrals to other services, and assistance with accessing community resources for food, job training, and housing. “ABCD Head Start is a gold standard early education and care program that supports our children’s education and overall well-being. It encourages positive growth, especially to disadvantaged and poverty-stricken families by providing nutrition, health screenings, and social services,” said John Drew, President/CEO of Action for Boston Community Development (ABCD). “This study with BMC addresses a huge need for our families. In our centers here in Boston, and in Head Start programs nationally, maternal depression is an overwhelming problem. It keeps our children and families from realizing their full potential,” Drew added. While PSE in this study was effective in preventing the onset of more severe depressive symptoms, Silverstein cautions that PSE may not be intense enough to break through clinically significant symptoms as a way to treat depression. “We’re working on disseminating our findings within Head Start to build capacity for problem solving education and addressing maternal depression, and we are hopeful that additional grants will allow us to continue implementing these interventions both in Massachusetts and nationally,” said Silverstein, who is also an associate professor of pediatrics at Boston University School of Medicine.